The Emperors of the sea Aka "Yonkos" are the 4 great pirates who are renowned and feared by both the masses and the world government. Rumors depict them to be so powerful and important that a loss/death of any, could have a ripple effect strong enough to destroy the authoritative order of some regions. Sadly enough, the Bounties of these Yonko are also unknown. What I'm trying to understand is how a pirate actually attains such a level; is it in any way related to the actual bounty of that individual or their second in command? we all know that Kaido and big mom had subbordinates who attained bounties roughly around 1 billion; is that the prerequisite for becoming a Yonko? But then if that were the case, it doesn't explain how Marshal D teech was able to slyly slip into the ranks of Yonko. Or is it more about who is closest to becoming the pirate King? Or more like whoever can defeat a Yonko automatically snatches the title? After luffy crashes Big Moms wedding and made it out alive, "Big news Morgan" announces him as the 5th Emperor of the sea and that really confuses me; Is all it takes to become an Emperor an announcement from a media outlet? To sum it up, My question is on how a pirate becomes known as a Yonko, is there a deeper meaning to the title itself? Extra Question lol: what did Blackbeard do differently from Trafalga law to become a Yonko?, after all they were both warlords for a short while. A Yonko is not an official title that has specific criteria, but rather is one that is attached to extremely powerful and notorious pirates. There is no deep meaning to the title that has been revealed so far, but it does go beyond simply having amazing combat prowess. Their own abilities are top notch. We've seen them possess immense strength and durability, have great control over Haki and most also possess strong Devil Fruit powers. They are among the top pirates even individually. They have fleets. Most of their strength is attributed to these large fleets that ally with the Yonko. You can see the exact known stats in the link above, we've seen Whitebeard, Big Mom and Kaido to have huge crews. Each of the Yonkos will have a number of Commanders under them, who in turn have groups of mid-level pirate crews. They have territory thanks to their influence as a Yonko. They can declare locations as their own, and pirates and Marines can only bend to their will. The people residing in these territories are under the protection of the respective Yonko, and intruders are hunted down. 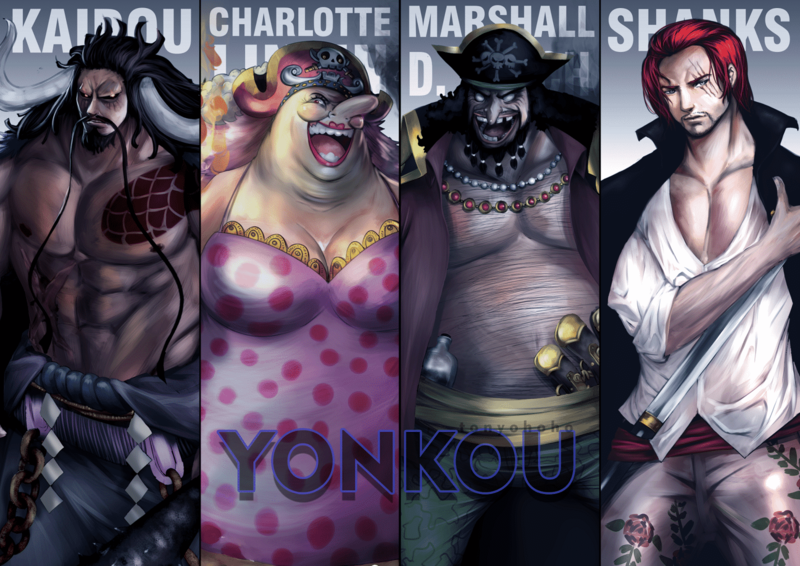 The Yonko are not a group like the Shichibukai, and each have their own agendas. Whitebeard was not interested in finding the One Piece and becoming Pirate King, whereas Blackbeard and Big Mom are. While they are the pirates with the best chances to become Pirate King thanks to this much power and influence, the relation between the two titles isn't very strong or clear yet. So, as we can see, the determination of who is a Yonko is also largely dependent on how notorious they are and how the other entities view them. In Luffy's case, Morgan simply hypes it up in order to make his news more entertaining. The media is not the deciding body for who is and isn't a Yonko, but it certainly shapes public opinion. his fight with Kaido in the latest chapter of the Wano arc. Now, for the differences between Law and Teach, I'll also throw Luffy into the mix and explain. Being a Shichibukai has nothing to do with Yonko, it is not a required step. Law doesn't have a fleet, and only has an alliance with the Strawhats. And while he is powerful, he isn't exceptionally so. killed Whitebeard during the Marineford war, and took his powers, becoming the first person to have two DF abilities. After the war, he quickly expands his fleet and takes over almost all of Whitebeard's territories. All of this together is what allowed him to be recognized as a Yonko. If we compare Luffy against these metrics, we know that he has formed the Grand Strawhat Fleet at the end of the Dressarosa arc (though he doesn't seem to assign it much value right now). We also have confirmation from Oda that the fleet will play a huge role in the future. In addition, when it comes to territories, Luffy has challenged Big Mom over Fishman Island, which was initially under Whitebeard, and he is currently challenging Kaido for Wano. While he may still be too much of a greenhorn to be a proper Yonko, he is definitely on the path to become one, which is why there are some proper backers (among fans), and his title as the 5th Yonko isn't being dismissed completely. How do they power the fridge in the Going Merry?